Appearance: Cameron stands at a lanky 6’1”, but manages to appear a bit larger due to his penchant for sprawling. 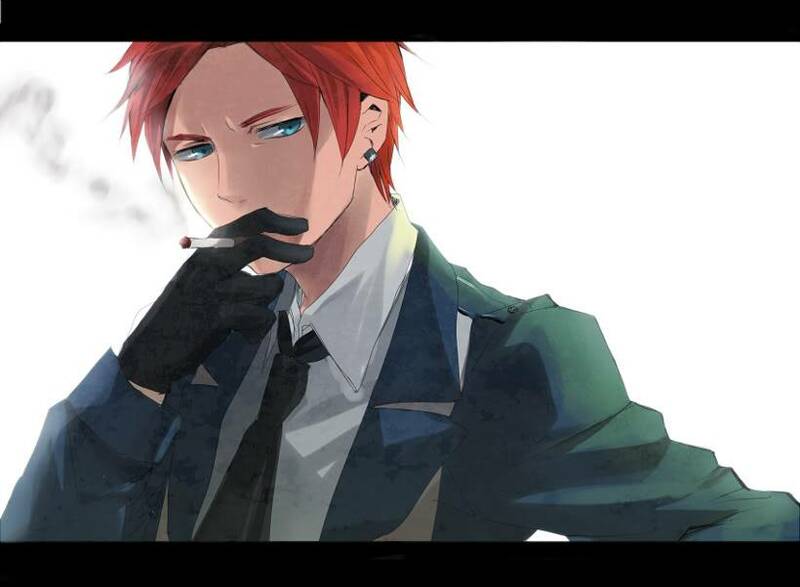 He has bright red hair and brilliant blue eyes that are usually half-lidded giving him a lazy look. His narrow face is framed by his unruly red hair, which hangs down in his eyes about half the time. He almost always (when outside the bounds of Hell anyhow) has a lit cigarette in hand. His robes are a dark blue with a medium green sash worn over his shoulder. His black feathered wings and sharp claws are the greatest difference from his previous form. Cameron’s human form wears an emerald stud earring in his left ear. He wears a long, dark blue coat over a white shirt and black tie. The top button of his shirt is always unbuttoned and his tie is always loose. He wears black gloves, because the one aspect of his appearance that invariably slips is his claws. He wears black jeans and an off-black toward green vest under the blue coat. Depending on the weather he might be found wearing a black tam’o’shanter. The lining of his coat is MacLaren plaid (seen HERE), evidencing his vices and his former virtues. He tends to leave it as the lining only, simply on the off-chance of encountering another demon who might recognize its significance. Rather than utilizing general sloth and laziness, Cameron tends to function within the subsets. He’ll put everything off that he can, and is constantly utilizing it to cause humans to put off church attendance and devotion toward God. He takes pleasure in his ability to garner despair, though he’s subtle in his ways of going about it. Sloth is his primary vice, but he utilizes envy to get to it. He’ll utilize a certain level of charm to draw humans to him—lacking lust, it takes a bit more work than for some demons—and then either make them envious, or make certain their significant other is envious. Gradually he builds out from there toward despair of the hope of the relationship. If he can convince a human there is no love, then his work is done. Personality: Cameron upon first encounter seems to epitomize sloth. He has a tendency to put off what he can, and ignore what he can’t put off. He’ll always get to it eventually, it‘s just usually not done until he’ll get in trouble for doing it any later. He constantly can be found lounging around, sprawled across benches, couches, chairs, patches of grass, etc, with his eyes half-closed and a cigarette in his mouth. He has an enormous amount of patience, for a demon, but the one thing that is sure to set of his temper (and he has quite a temper) is envy. He has no problem at all causing envious feelings in others, but any sense of jealousy that he might feel is cause for his temper to rise to the surface. It is the one thing guaranteed to set off his temper. The one thing that Cameron always seems to get in trouble with his superiors for is the last vestiges of his charitable virtue. He had managed to let go of most all other virtues, but once in a while will find himself drawn to help those in need. He can usually convince himself to put it off, but every so often a need is great enough that the part of him that had been devoted to acts of charity comes forward and he acts upon it. History: Cameron has always been rather lackadaisical about his approach to his responsibilities. Not that there were all that many prior to the creation of mankind, which came not long before his fall. He fought well on the side of the Angels during the Battle of Heaven, sustaining a number of wounds and giving as good as he got during the fighting. He healed gradually, but fell shortly at the time of Noah. He watched as men ignored the needs of their fellows, and found that even the heavenly host could do nothing to aid them. The virtue of charity within him longed to do something, but he realized it was too much for a single being to do. Something had to be done, but the answer to the cruelty and injustice in the world was what finally drove him to turn his back on the Almighty. Yes, mankind was adding new and creative actions to a long list of atrocities, but to wipe them all out (well, all but 8 and he hardly considered that that counted) went against every part of him that cried out to aid the people. Part of him tried to justify it as the fact that the Almighty was all-knowing and so surely there was too much sin, but the other part (the larger part) pointed out the children and the needy who died as well. He renounced the Ruler of Heaven and fell. After his fall, it took some time for Cameron to become accustomed to his roles, and more than that it took time for him to build what could qualify as trust with any of the other demons. He’d fought valiantly—against them. Grudges are not easily released when one has no inclination toward forgiveness. He ignores how little help he can give to people now—considering where they end up in the end if he does his job right—and goes about his life as best he can. He’s grown jaded, and has little care one way or the other for most beings. He might help a person who is in the worst possible situation, but beyond that he avoids it. He has no desire for punishment and would rather see to his own comfort than to the difficulties of others. To aid is to give a piece of yourself—even if it is only pity—and he will not risk that again. RP Sample: Cameron leaned against a light post, struck a match on the bottom of his shoe, and lit his cigarette. He shook the match out and took a deep breath of the smoke, breathing it out and watching it curl up toward the light above him. Damn he loved this time of night. It was just after the sun had set, but just before the nightlife began. The shadows engulfed one and all, and the silence was almost unbroken. It was the perfect time to start scouting, a perfect time to see who was with who. It was a time of affairs, a time of hatred, a time of secrets. It was his time, and damn he loved it. His lazy blue gaze drifted along the street, finally coming to rest on a young woman headed his direction. He wasn’t certain if he’d be able to use her as a mode toward envy or if she would be the one to feel the emotion, but when had that stopped him before? Once. But that was then. This was now. This was his night.